Monica and I spent two weeks in India in February 2005. Our main objective was to see and hopefully photograph a tiger. We went first to Bandhavgarh National Park where we were fortunate to see six different tigers and to photograph four of them. From all that I have been told Bandhavgarh is today the best place to see tigers - but it is not all that easy to get to. Our journey entailed a 17 hour train journey from Delhi - but it was certainly worth it. We stayed at the Tiger Den Lodge, which is excellent, and for four days we toured the Park accompanied by a first-class naturalist, Jagat Chaturvedi who works out of this Lodge; each morning and afternoon we toured the park in the local equivlent of a Jeep and encountered tigers on three of the four days we were there. From Banhavgarh we took the train to Agra to revisit the Taj Mahal, for many the most beautiful building in the world, and then drove to Bharatpur to revisit Keoladeo National Park, one of the most important bird sanctuaries in Asia. This year is election year in Rajistan and whereas farmers have votes birds do not so little water has been released into the Park. Apparently this happens every five years when there are elections. I had heard that there would be few birds and going to Keoladeo with no water was a waste of time. This was not the case. Certainly there was not the flooded plains which were there the last time I visited but there were still large areas of water and the birds were concentrated here so that in many ways bird photography was easier. On our first morning I located the rickshaw driver, Sheru Singh who I had got to know and respect as a great naturalist, on my last visit. He rides Rickshaw No 42 and I can recommend him as the best man to accompany a bird photographer into the Park. He was joined by his younger brother, Bagat Singh (No 56) and together we had a great two days - all too short, I fear but we had to do some sightseeing in Jaipur which we had not visited for 34 years! India is a great place to visit particularly in January-February and I can highly recommend the company which made all the arrangements for us: Namaste Tours (Bala or Rajeev) Email: namaste1@vsnl.com. They do not specialise in wildlife tours but they certainly came up trumps for us. Beside the road dancing bears are still paraded to perform for tourists. 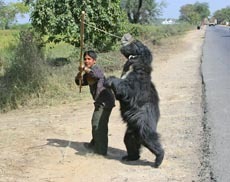 The authorities have banned them because of the cruelty involved in their training and the fact that the Sloth Bear has become an endangered species and adult mothers are killed to obtain the babies. We noticed that they seem to be fewer than when we last visited in 2000.